For many of the 1500+ sailors on 162 boats on course to Bermuda in the 49th Newport Bermuda Race, yesterday’s Summer Solstice must have seemed like the longest night ever. Shockwave, the line honors leader at noon Saturday then 438nm from Bermuda, was still 336nm from Bermuda at 2:00 AM Sunday. The 2012 Gibbs Hill Lighthouse winner was averaging a velocity made good to Bermuda of 8.3kts, compared to 9.2kts up to noon Saturday. At 2:AM Shockwave was doing 10.3kts making a good course of 152º toward Bermuda. For those 14 hours, Shockwave had averaged 7.2kts. George David’s Rambler had averaged 16.1kts on the way to smashing the record in 2012. Rambler sailed the entire course in 39hrs 39min. The mini-maxis are well beyond that now, so no record will fall in 2014. 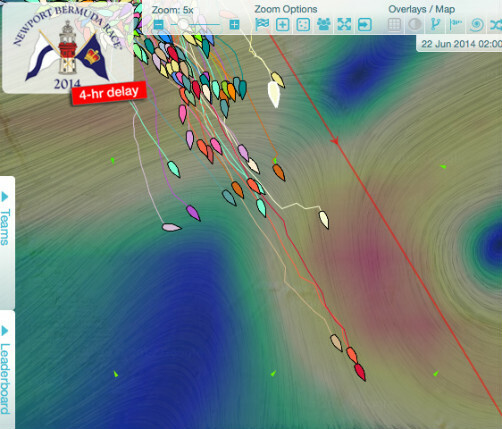 The 2:00 AM snapshot of the fleet on the Pantaenius Race Tracker, online for everyone to see, showed the back of the fleet taking a hard right turn. Hard in the sense that it is a 90º turn to the west, but harder still insomuch that these boats are sailing a bad tack to Bermuda or just drifting at less than 1kt. Dock talk in Bermuda will be stories about no wind or a big bad windshift during this long Summer Solstice night. Christopher Dragon, estimated to be in the lead for best corrected time at Noon Saturday, still held that position. Then she was 477nm from Bermuda. At 2:00AM this morning she was 396nm out, making only 81nm in 14hrs, averaging 5.7kts She was reported as doing 8.2kts heading 141º. Carina, winner of St. David’s Lighthouses in 2010 and 2012, was 457nm away reported doing 2.1kts steering 138º and just out of the pack drifting west. Carina had covered only 33nm toward Bermuda in 14 hours but appears to be breaking out of the drifting pack at 2:00AM. The big difference between the faster, leading boats and those further back is the Gulf Stream. Carina and Christopher Dragon, two of the leading boats on corrected time, are nearby and in the axis of the Gulf Stream which is flowing west to east. The current may actually be making wind for them, giving them additional apparent wind to sail with. At 2:AM today, the leading mini-maxis had reached the southbound cold core eddy, and were picking up a free ride toward Bermuda. The slower boats in the drifting conditions are north of the current and will suffer till the wind builds today, maybe this afternoon. At noon Saturday, Sinn Fein, the other two-time St. David’s Lighthouse winner (2006-2008), had been in second place based on estimated corrected time. She was 458nm out at noon Saturday and by 2:00AM was sailing at 1.9kts heading at 124º. Selkie, sailed by Sheila McCurdy, past Commodore of the Cruising Club of America, was stuck in the back half of the fleet in a drifter doing a painful 0.3kts and drifting at 249º. Newton Merrill’s Finess a J42 just west of Selkie was doing 1.1kts at 90º drifting painfully the other direction. Joe Harris in Gryphon Solo2, a double hander, was just picking up a breeze and the eastbound current. He was doing 7kts at 158º. The best way to follow the race is to log onto the Pantaenius Race Tracker. Dobbs Davis has a very useful Race Tracker Tutorial. Dobbs, an experienced racing sailor and columnist for Seahorse Magazine, is posting a daily morning race report on the website, beginning with his Friday Bermuda Race Preview. One of the most important players in any Bermuda Race is the Gulf Stream. Currents and winds are displayed on the tracker. For a report on this year's Stream, see Dr. Frank Bohlen's Gulf Stream Tutorials. Happy Valley, Class 10, Cruiser, Richard J. Maddock, withdrew from the race at 5 a.m Sunday due to slow progress and is returning to Easthampton, NY, via Block Island. Wandrian, Class 3, St. David's Lighthouse Division, William Tucker, withdrew on Sunday with steering problems. www.BermudaRace.com — carries Newport Bermuda Race rules, news, videos, photos, history, and expert advice. Race news is also posted on the Newport Bermuda Race 2014 Facebook page and on Twitter at @BdaRace.